TWO first-time operators from Glasgow have relocated to the Highlands and taken the reins of a 12-bedroom hotel – and are already ringing the changes. 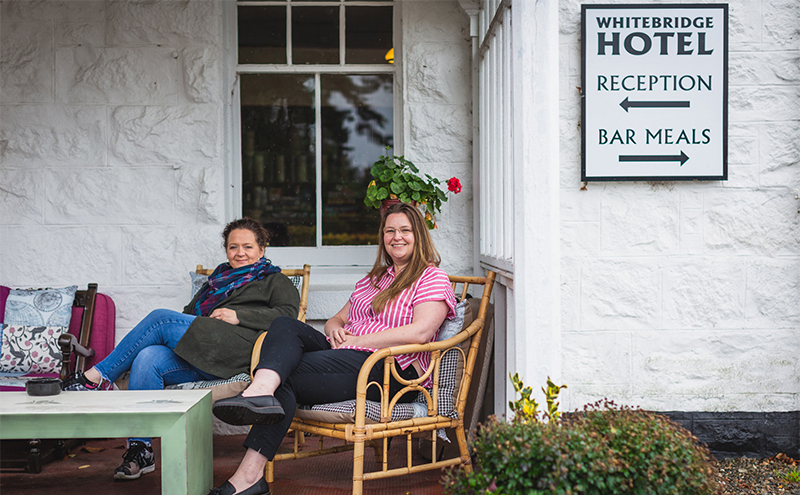 Lesley Renton and Isabella Kilgannon, who have long harboured ambitions of running their own venue, worked with Barclays to secure a commercial mortgage, allowing them to purchase the Whitebridge Hotel in Stratherrick, Inverness earlier this year. And they’ve not hesitated in putting their own stamp on the business. Lesley, who previously worked at the Tron Theatre in Glasgow where she oversaw the bar and restaurant operation, told SLTN that coming into the hotel in June – at the beginning of the summer season – “was a bit of a baptism of fire”. “We came into the trade on June 22, which was just before the schools broke up and everything got very busy, very quickly,” said Lesley. But she said they’re relishing the challenge of being hands-on. “We’re enjoying it, it’s just starting to quieten down now and we’re managing to get some of our plans in place because the summer period was pretty much hitting the ground running,” she said. One of their core aims was to accommodate not just the varied tourist trade that the hotel attracts at different points of the year, but also to appeal to the locals. “We’re very much about embracing the local market and making sure we’re catering for their needs as well as the hotel guests,” explained Lesley. One of the ways in which they are addressing this is by ramping up events in the hotel. “We’ve put on a Sunday roast every Sunday for the past three months and got a solid following,” said Lesley. “The first event we had was a quiz night a couple of weeks ago and it sold out – a lot of people were really pleased with it. And there’s plenty more in the pipeline, with ‘murder mystery’ nights planned for later this month, as well as quiz nights and music events. Lesley added that they are “excited about the future for the hotel and hope to capitalise on the local demand”.